Baltimore Orioles first baseman Chris Davis set an inauspicious Major League record this week. But with his enormous contract, he and the Orioles are trapped in a baseball purgatory, in which he's almost forced to keep playing until he breaks out of his slump. 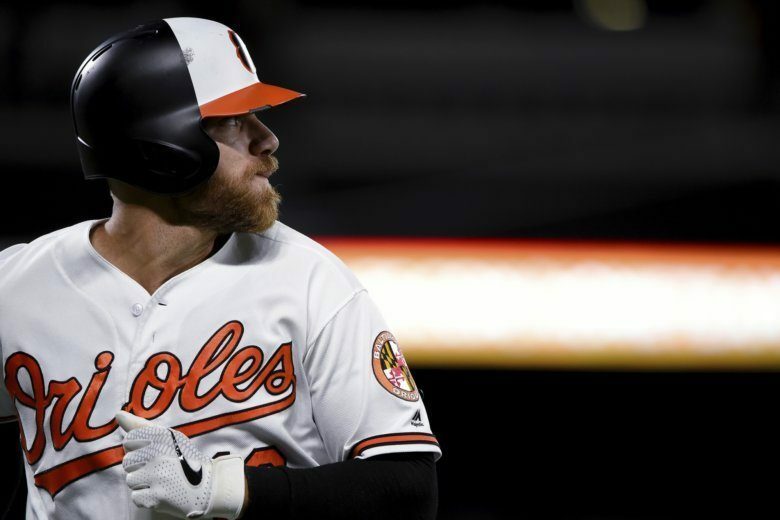 Perhaps you’ve heard, but Baltimore Orioles erstwhile slugger Chris Davis is in something of a slump. Monday night, Davis went 0-for-5. In his second at-bat, he lined out, the 46th straight time he had registered an at-bat without a hit, tying Eugenio Velez’s Major League record. His next time up, he lined out again, setting a new MLB record. He struck out his final two times up, stretching the streak to 49. His last hit was Sept. 14 of last year, a season in which he hit .168, the lowest by any player with enough at-bats to qualify for a batting title since 1909. Nobody likes to talk about a slumping player, even if he’s in the other clubhouse. Everyone is fully aware, it seems, that such an 0-for-49 could afflict just about anyone, and that they might well not have the luxury to get half as far down such a well before finding themselves in a different jersey in a minor league city. But, of course, that’s the thing that makes Davis’ situation so problematic. He’s not just making $23 million this year*. He’s making $23 million next year. And the year after that. And the year after that. All money is guaranteed in baseball, so there’s no buyout situation in play. No team wants to absorb that kind of financial dead weight, so whatever slim chance the team may have had to trade him last season has essentially evaporated. They’re stuck with one another, unless they cut him loose entirely and eat more than $90 million in remaining salary. After breaking the record Monday night, Davis sat on the bench Tuesday. The visiting Oakland Athletics had a crafty lefty on the mound, Brett Anderson, so you could make a simple matchup case for doing so and nobody would ask any questions. On Wednesday night, they sat him again, this time against second-year right-hander Frankie Montas. Perhaps the most fascinating reaction to Davis’ predicament has come from the Camden Yards crowd. After booing Davis when he struck out during the home opener, they continued to voice their displeasure over the next week. But when Monday night rolled around, with inauspicious history on the horizon, the vitriol shifted to encouragement. They clapped for him with each at bat leading into the record. Davis even earned a reprieve on a dropped foul ball in the 46th at-bat, but lined out to Robbie Grossman in left to tie the record. Then, in the fifth inning, he lined one even harder the other way, Grossman retreating to the warning track, but reeling it in for Davis’ 47th consecutive hitless at-bat. Yusmeiro Petit was the pitcher delivering the pitch that would put Davis in the record books Monday night. He acknowledged that he knew the scenario, but that it didn’t change anything on his end. Petit said it’s all part of the game, being a professional. But he also didn’t want to be the one giving up the hit that broke the streak. A journeyman who has pitched for six different Major League teams since 2006, he has seen slumps up close, in his own clubhouse. In 2009, Mark Reynolds was on his way to a 223-strikeout season when both played for the Arizona Diamondbacks. At one point, Petit approached his teammate to see if he was all right. In the other dugout, homophonic namesake Khris Davis had been going through a slump of his own, hitting just .192 without an extra-base hit his last seven games. The A’s Davis has usurped the O’s Davis’ reign as MLB home run king. From 2012-15, nobody hit more than Chris (159); since 2016, nobody’s hit more than Khris (140). As if to drive the point home with a sledgehammer, the A’s Davis hit not one, but two opposite field home runs — right field, for him — as part of a 3-for-5 evening Wednesday night. A thought experiment among fans of the local teams questioned what would happen if struggling Nationals reliever Trevor Rosenthal — who had yet to record an out this season, sitting with an ERA of infinite entering Wednesday night — faced Davis. Stoppable force meets movable object, and all that. Rosenthal pitched the ninth inning of the Nats’ 15-1 blowout in Philly. He gave up the one, but finally got three outs, establishing a 72.00 ERA. Davis also made it into the game in the ninth inning in Baltimore Wednesday night, pinch-hitting. Facing Petit once more, he lined out to center. *Technically, Davis is making $17 million each year, with annual deferrals of $3.5 million from 2023-32 and $1.4 million from 2033-37. You can decide what’s worse.